Bed breakfast Champagne Paris Disney Epernay and Reims (Rheims Champagne). B&b Paris. Elegant bb accommodation and self catering cottage in a beautiful garden. Our bed and breakfast hides in a garden with some very old trees and many roses, only minutes away from the Champagne vineyards. 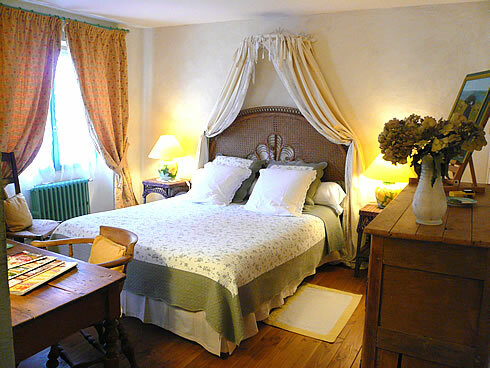 Bed and breakfast in Champagne: Our double room Rose de Meaux can be prepared with 2 twin beds of 80x200 cm on prior request. Our romantic b&b welcomes you all year round. In the winter we will greet you near the old fireplace of the lounge. 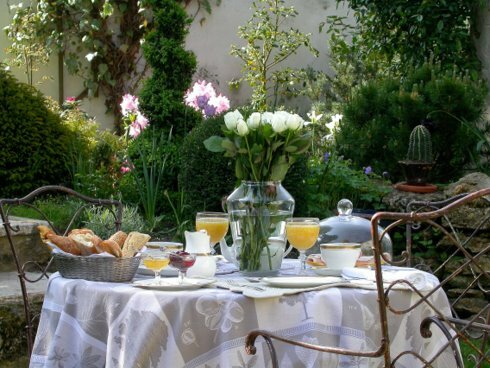 When Spring arrives, weather permitting, the breakfast can be taken in the garden: a highlight for a romantic stay in Champagne. Spend a romantic stay at our bed and breakfast in Champagne, even in Winter: the Swedish tile stove provides a cosy atmosphere for breakfast in the library. 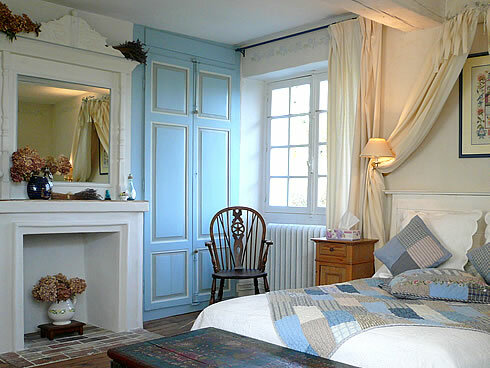 Our bed and breakfast near the Champagne vineyards offers romantic, comfortable, cosy and charming rooms. Here is our room Belle de Crécy. 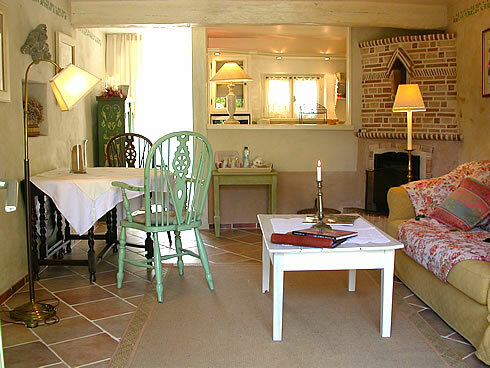 Our cottage Rose de Provins has a lounge open to a small private garden. In Winter it is very romantic to spend the evening near the fireplace. For an even more charming stay at our bed and breakfast, you will taste your breakfast in the library on an elegant table. The delicious jams are home made by Martine, with organic fruit and spicies. 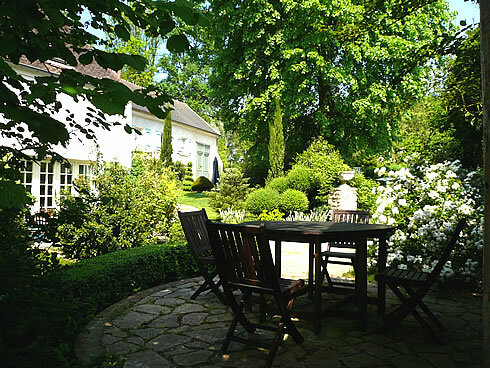 Our self catering cottage Rose de Provins has a little private garden, with a terrace and a barbecue. Ideal for a romantic and comfortable stay from Spring to Autumn, only minutes away from the Champagne vineyards. New : * Number or letter cake Reserve on-line when you book. * Choux pastry : Make your own real French pastries including "religieuse au caramel" and learn poaching techniques to make all forms of pastries. Reserve on-line when you book. * Old style linen boutique : discover Véronique's collection of embroidered sheets, napkins, table cloths made from cotton, linen and hemp. Le Clos de la Rose is a Romantic 18th Century property hidden in a garden in Saint-Cyr sur Morin, Seine-et-Marne, Paris area, France. Definitely a special place to stay! Pamper yourself ! - Enjoy our exceptional evening dinner service at Le Clos de la Rose, Véronique, your host, is a qualified pastry chef ! Dinner TERROIR or Dinner for GOURMETS? New spring/summer menu : Gaspacho melon and coppa, followed by a delicious, salad with avocado, smoked salmon, shrimp... then a selection of delicious local cheese and a dessert. EUR 29 / person (drinks are not included). Or a A set menu 'du terroir' including a home made soup, home made pie (warm) with salad, followed by a selection of delicious local cheeses and dessert. EUR 29 / person (drinks are not included). Or a 4 course delicatessen cold dinner: homemade salmon with dill recipe, a beautiful plate of foie gras (duck liver) with chutney and salad, a selection of delicious local cheeses and dessert. Or a Menu for special occasions : Champagne based apéritif and homemade appetisers, starter - lobster, main dish - beef and vegetables, calvados & sorbet, selection of 2 cheeses from the region, dessert followed by coffee or tea and homemade pastries. EUR 75/ person (drinks are not included). For longer stays depending on your taste, do not hesitate to ask us. We can do specific meals to order on prior reservation. Our menus are best with a bottle of local Champagne (to be ordered separately) or another wine from our winelist. Dinner is served from 8 to 10 pm upon prior reservation only. Easy online booking option when choosing your accommodation. Book now for a unique moment of WELL-BEING - a relaxing massage with essential oils! 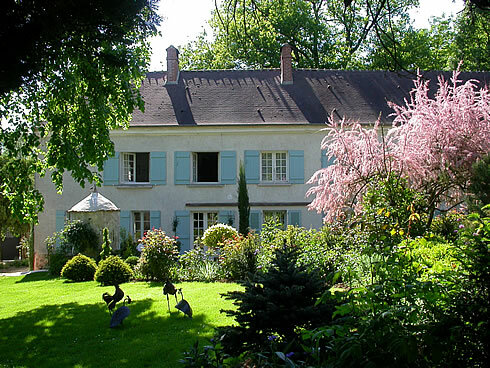 Le 'Clos de la Rose' is a romantic 18th Century property hidden in a garden with roses, birds and some very old trees. The cottage (with all modern comfort) is located in a delightful hamlet in the Seine et Marne region, 68 km East of Paris, 35 minutes by car from the Disneyland Resort. You will laze in the gardens or have long walks through the woods and fields of the Brie region. You will visit some of the most famous historical places in Ile de France like the Abbey of Jouarre, the Middle Age city of Provins (World Heritage)... Gourmets will taste the famous Brie cheeses and Champagne wine. Champagne vineyards are only 10 min by car. Furthermore you will find some of the best value Champagne only minutes away from our house. We will share our best local Champagne winemaker addresses with you: a genuine discovery for wine lovers and a satisfaction for your credit card since the bottles you will discover here around offer a fantastic value for money! Famous chateaux including Vaux-le-Vicomte and Chantilly are within 1 hour drive. Several Golf courses (30 mins by car). This is an elegant place to stay for a romantic holiday. Are you travelling in the area for business? From Le Clos de la Rose you will be able to manage your business on the Eastern side of Paris or in the Champagne region, combining efficient work, comfort and pleasure. Broadband internet connection with wireless access in the main house and via cable connection in the cottage and TV are available free of charge. Would you like to organise a private event : birthday, anniversary, hen night, stag night ? If so, contact us and book the entire domaine and make the most of your weekend in a secluded and private get away with your friends and family. We can organise meals, drinks, cooking classes, local outings to make the most of your stay with us. Do not hesitate to call us or make an on-line enquiry on our website for more details. What about discovering Alsace? 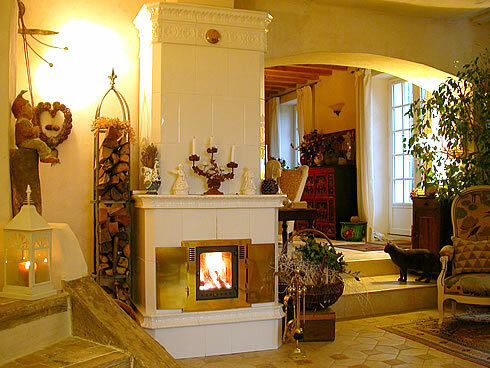 Stay in our new romantic gites and apartments in Riquewihr and La Vancelle, Alsace! We offer 3 lovely and romantic vacation rental apartments with outstanding features in the medieval village of Riquewihr, near Colmar in Alsace and - from April 2009 - 2 new apartments in the charming village of La Vancelle only minutes away from the wine route and all major places of interest. * For Riquewihr click here. * For the village of La Vancelle click here. Alsace and Riquewihr or La Vancelle are beautiful destinations all year round. Spring, Summer as everybody would imagine, but late Autumn is often a beautiful season in Alsace. Do not forget to book a long time in advance for the worlwide famous Christmas celebrations. A genuine fairy tale starting end of November and ending beginning of January. 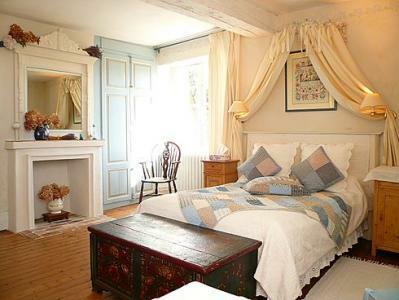 French Bed and Breakfast published by Alastairs Sawday in Great Britain. A famous british guide. The guide Rivages des Chambres d'hôtes de charme en France, 2016 and 2017 editions. 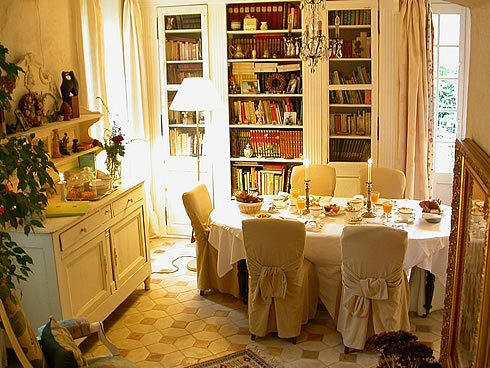 This is the most famous French guide for bed and breakfast in France. Whether you wish to spend a B&B weekend in a beautiful and traditional house of Ile de France - near Disneyland Paris - or want to stay for a longer period in our elegant self catering cottage, you will benefit from a privileged nature and environnement. Are you travelling in the area for business? More and more business travellers prefer to stay in an elegant and well equiped b&b rather than in the hotel. We are 30 minutes away only from Val d'Europe and Disneyland Paris and less than 1 hour by train or car from Paris. Le Clos de la Rose provides excellent bed and breakfast or self-catering accommodation for business travellers. From here you will be able to manage your business on the Eastern side of Paris or in the Champagne region, combining efficient work, comfort and pleasure (Internet connection via wifi and cable in the main house and via cable only in the cottage and TV available with no extra charges). 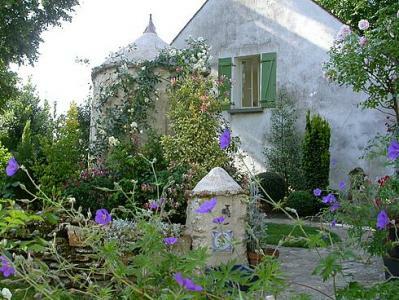 3 wonderful apartements in historical setting and one of the most beautiful villages of France. Romantically decorated with a green-yellow lime wash, this little room is the cosiest in the house and has private en suite shower and toilet facilities. Room for 2 persons. Rates are variable according to length of stay. 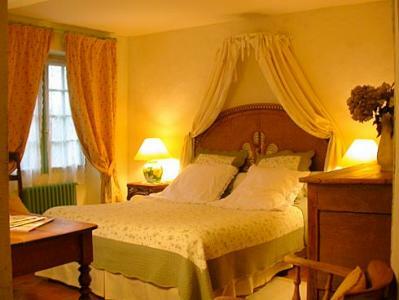 Charming, romantic and elegant room available for bed and breakfast all year round. With a lime wash decoration in the blue-grey tones it used to be the private bedroom of the owners. Room for 2 persons. Rates are variable according to the length of the stay. Independant cottage with garden lounge and fireplace, room + bath en suite. Kitchenette. Minimum stay 3 nights for self catering. Also available for shorter stays (minimum 2 nights on weekends).